It is our great pleasure to present the publication “Nationless” which came as a product from the collaborative initiative between the Institute of Social Sciences and Humanities – Skopje, the organization Dam Dash- Belgrade and the Department of Balkan, Slavic and Oriental Studies in Thessaloniki which brought together around 100 artists, theoreticians and activists in a series of exciting events in the three cities. Some of the materials produced during these are presented in this publication. he project NATIONLESS was created to open a space for artistic intervention, thinking and re-thinking the particular issue of nationalism and its social reproductive power with a specific focus on the broken communication and a virtually complete lack of collaboration between regional artists and intellectuals. 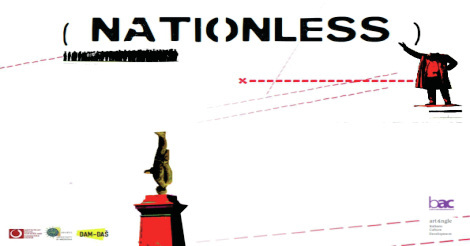 However, the project NATIONLESS does not seek to overcome the mere problem of lack of communication but rather, through an artistic undertaking, to challenge competing nationalisms in the different countries through artistic-political and theoretical explorations of the idea of “nation.” The political status of “nationality” is the main pillar of all other political and social categories and processes in these three countries. It determines the cultural capital of nationhood and national origin which further influences the economic processes and possibilities of social mobilization and solidarity. Therefore, this project seeks to problematize national(ist) identity politics that are ‘inclusive’ for some, and always ‘exclusive’ for the others and paralyzing of all politics that debunk the sanctity of the ethnic principle of social mobilization. The project represents a counterweight to the current political tendencies by engaging grassroots actors to tackle the social consequences of the mainstreamed nationalism.